A Red Cross volunteer since 2000, Rachel Olmanson, from Cleveland, MN, has deployed to two national responses – Hurricanes Matthew and Katrina – where her involvement was working mostly to distribute meals and relief supplies to people living in neighborhoods. Recently, Rachel got a new perspective on disaster relief compared to her past experiences. After multiple tornadoes hit southern Minnesota communities on September 20, Rachel took on the role of photographer and traveled with damage assessment and client casework teams in the towns of Waterville, Faribault and Morristown. Rachel’s pictures depict volunteers action planning, assessing overall damage, community members coming together to clear fallen trees and other debris, and residents assessing home damage while trying to figure out next steps. “I really could see a sense of community with neighbors outside helping each other to remove brush and trees off and around homes,” she says. To see more of Rachel’s photos click here. Story by Kevin Berger, Red Cross volunteer. Photos by Rachel Olmanson, Red Cross volunteer. Click here to learn about serving with the Red Cross. Many thanks to Elaine (in photo) and around 3,000 Red Cross disaster relief workers, including 62 from the Minnesota Red Cross, who are helping people affected by Hurricane Florence in North Carolina and South Carolina. Sunday night, more than 15,000 people sought refuge in more than 150 Red Cross and community shelters across the impacted region. This includes 14,200 people in 137 shelters in North Carolina. 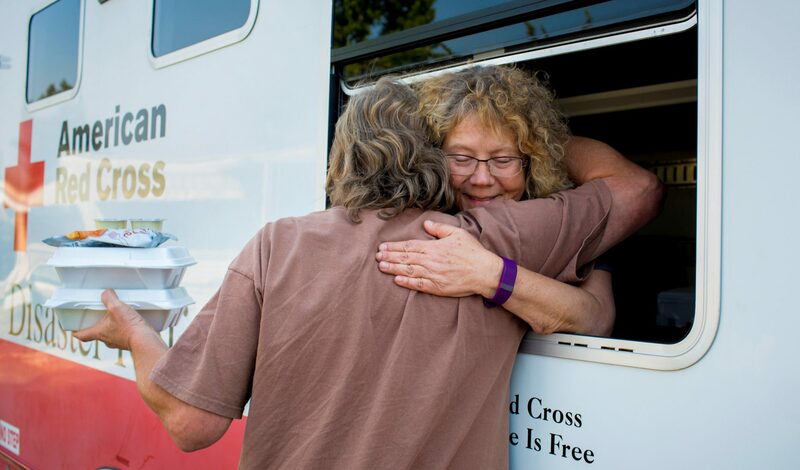 Working with partners, the Red Cross has served 150,700 meals and snacks. We’re also working with the Southern Baptists to deploy field kitchens that together can produce 170,000 meals per day. The Red Cross is mobilizing more than 130 emergency response vehicles and more than 70 trailers of equipment and supplies, including ready-to-eat meals and enough cots and blankets for more than 100,000 people. The storm has forced cancellation of more than 170 blood drives, resulting in more than 4,600 uncollected blood and platelet donations. The Red Cross will continue to work around-the-clock to do everything possible to provide shelter, food, comfort and other emergency support to victims of Hurricane Florence. Nearly every eight minutes, the American Red Cross extends a helping hand to a family in need that has lost everything – the roof over their heads, their clothes, and their most cherished possessions – to a home fire. Across Minnesota and parts of western Wisconsin, the Minnesota Region of the American Red Cross has been busy helping neighbors. But your help is needed on one special day to continue to provide the emergency services that our neighbors depend on every day. On April 21, you have a chance to help families in need whenever and wherever they need it by participating in the national American Red Cross Giving Day to #help1family. A donation of $88.50 can provide a family with a day’s worth of food, plus blankets and other essentials. We’re proud of the disaster relief our region provided last year. This included supporting more than 2,300 people affected by local disasters, which were mostly home fires, and installing more than 1,000 smoke alarms to improve home fire safety. 1. Supporting a family in urgent need: provide funding to give a family a day’s worth of food, blankets, and other essentials. 2. Supplying warm meals: help provide hearty, comforting meals to people impacted by disasters. 3. Providing clean-up kits after a disaster strikes: make clean-up kits available for families in need that include vital items like a mop, bucket, and disinfectant. 4. Deploying an emergency response vehicle for a day: Red Cross workers travel to impacted neighborhoods in fully stocked Emergency Response vehicles to provide food, water and critical relief.